If you believe the review of your company contains inaccuracies, please fill out the form below and help us understand the specifics of your situation. The contents of this form are communicated directly to our Reviews Team. Please note: The Reviews Team deals with a large quantity of requests each week. As a result, the Reviews Team is not able to respond via email to every individual request. They are however committed to making all updates and changes per each request as they deem necessary. In order to prevent fake and misleading user reviews, we have a review moderation team specifically assigned to moderating all user reviews for all companies listed on the site. This team follows a very specific and strict moderation process that has been designed by gathering learning’s from mistakes other major review sites have made in the past. Is the user an employee of the organization? Is the user associated with a competitor of the organization? As you can probably tell, we take our user review moderation process very seriously. We believe accuracy and authenticity is critical when it comes to user reviews, and as a result we are constantly finding new ways to evolve our user moderation process to make it better. Please note that we do manually moderate each and every user review. Once a user review has made it through the moderation process, the only way it can be removed is via a “removal request” from the consumer. In order for this to validate properly, the consumer needs to email [email protected] using the same email address they used to submit their review. They need to communicate in that email their request to have the review removed. 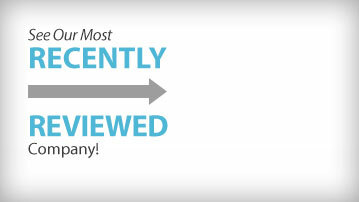 We consider this Expert Review process a vital component of how we rank and review companies. As a result, the factors included are always changing, adapting, and updating. We also reserve the right to voice our expert opinions as a part of each review. 5. We Hate Making Mistakes! Our Reviews Team hates making mistakes and publishing information that is inaccurate in any way. We want you to know that we want your help cleaning up and fixing any inaccuracies that you may find. This helps us tremendously in keeping the content accurate and maintaining our site integrity. We welcome all of your feedback, which is why we put together this form to help us streamline more of your requests.